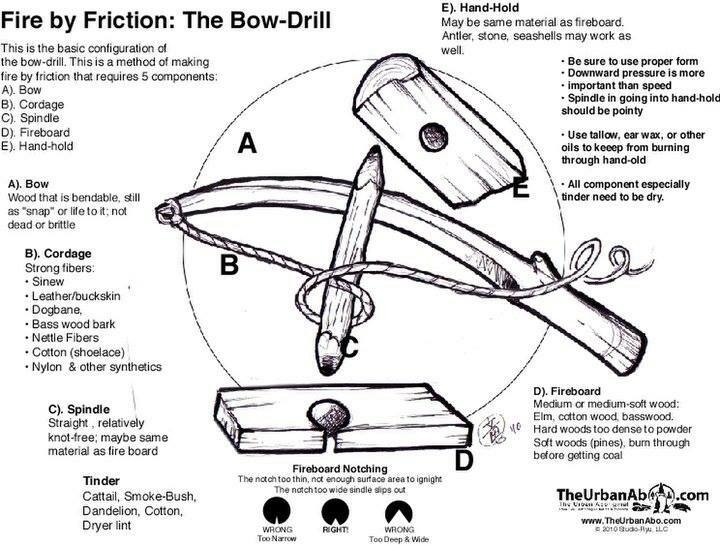 The bow drill is an ancient tool. While it was usually used to make fire, it was also used for primitive woodworking and dentistry. It consists of a bearing block or handhold, a spindle or drill, a hearth or fire-board, and a simple bow. Related drills include the pump drill and the hand drill. This is an ancient method of starting fire without matches. It uses friction to generate heat. The heat eventually produces an ember in the burnt sawdust. The ember is tiny, smaller than the head of a cigarette, and fragile. Once the ember is formed it is carefully placed into a "tinder bundle" (a bird's type nest of stringy, fluffy, and combustible material). Once the ember is in the tinder bundle it is then carefully nurtured and coaxed into flame. Once the tinder bundle bursts into flame, it is then placed into the fire lay. The hearth and spindle can both be medium-soft woods; yucca, aspen, cedar, basswood, and most willows all work very well. Combinations such as hazel and poplar also work well. The bow should be stiff but slightly limber and around 30 inches long. The bearing block can be made of anything that is harder than the spindle, although bone, antler, and stone work best, as they can be easily greased, do not create as much friction, and do not burn.